Although the PS3 audio is designed to be automatically set-up when you first hook up your console to your tv or home theater system, some people will still run into problems. Generally, most of the problems result from more complicated home theater connections or as the result of a change of components that the console is connected to. 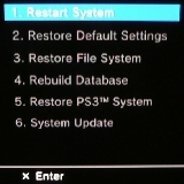 The PS3 Audio settings are accessed through the XMB Settings column and most audio problems resulting from the console itself will be corrected from there. For instructions on navigating the XMB please see our XMB section. When using this cable to connect to your tv or monitor, no audio will be transmitted to your tv due to the fact that DVI does not transmit audio. The solution to this is to use an additonal digital audio cable or the standard PS3 connector to connect the composite audio cables to your tv or monitor. The use of a digital cable or the PS3 composite audio cables will be dictated by which type of audio connections you have available on your tv or monitor. After you connect the proper cable you will need to go into the audio section to change to the proper setting. The PS3 should transmit audio over 2 different connections but, the secondary connection will only transmit two channel stereo sound. If you are using the receiver as your primary sound source then make sure that you have the audio settings, on the PS3, set to the proper connection type for your receiver. These settings can be changed via the XMB under audio. Most audio issues result from improper connections made at the tv, monitor or receiver. For example, you need to make sure that if you are connected to video 1 that you are using the audio connections for that input. Also, when using a DVI input, make sure that you use the corresponding audio inputs. We will try to cover more audio issues and fixes as they are brought to our attention. If you do have any specific questions we can be reached through our Contact Us page.